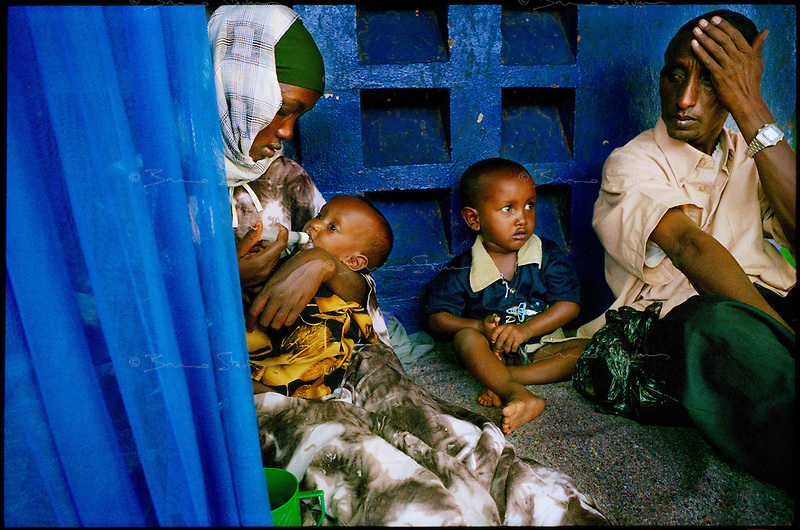 Mandera, NE Kenya, March 2006.Mandera district hospital, ACF operated TFC. Faduma Sheikh Hassan, 19, left, feeds her daughter Sumaya Yusuf, 9 months with enriched milk, with her son Abdel Kader Yusuf, 2 and her husband Yusuf Ali, 32, right. Millions semi-nomadic herdsmen who are leaving the bush to come and live in camps near villages as their livestock is decimated by a persistent drought, abandonning their traditional lifestyle.